HafenCity lies to the south of the main Hamburg dike, which runs along Zollkanal - as indeed does the Speicherstadt. This means that the existing dike offers the new district no protection. A special solution therefore had to be worked out to defend this new part of town against occasional storm surges. 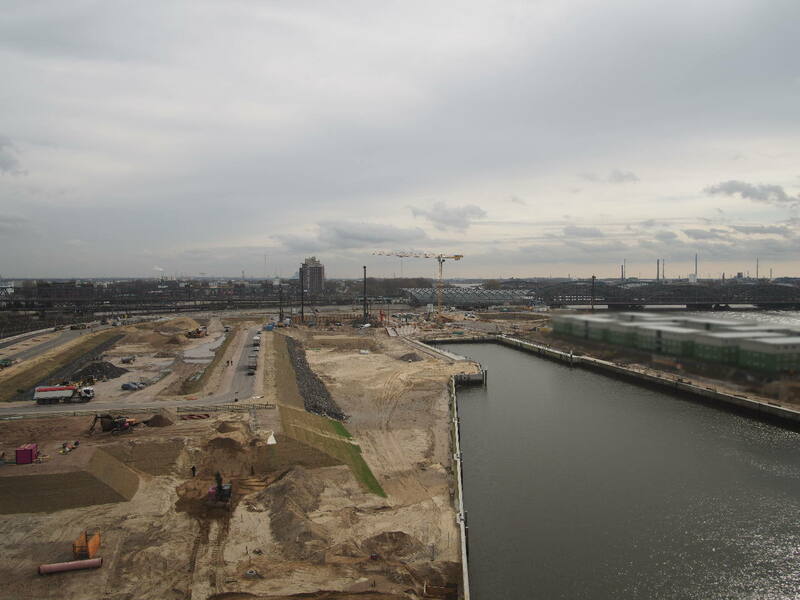 Surrounding HafenCity by dikes would have created a series of distinct disadvantages. Proximity to large expanses of water is what gives the new district much of its charm; dikes would have deprived it of the many exciting sight lines down to the water - particularly in the public built environment. Another point is that complete enclosure of the 127 hectare site by dikes would have had to have been completed before any construction of buildings began; a technical and economic tour de force of that kind would also have put the successive development of the district in question. But by elevating the buildings on plinths made of mounds of compacted fill ("Warften" in German), it has been possible to connect HafenCity with the existing city area and develop it step by step from west to east, and from north to south. All new buildings stand on artificial bases eight meters above sea level - out of reach of the most extreme flooding. On the exposed windward sides, such as the southern sides of Strandkai and Überseequartier, the external perimeter will actually lie at 8 to 9 meters above sea level. It is the responsibility of the private developers of buildings to put these artificial compacted bases in place, so their number is growing as the number of buildings increases. This has dispensed with any need for premature financing of flood-protection measures years - or even decades – ahead of the sale and deployment of the sites concerned. The interior of flood-secure plinths provides ample space for underground car garages, which means that almost all stationary traffic can be accommodated. The "Warft" solution therefore also makes a significant contribution to reducing the volume of private transport in the new part of town. No additional sites for above-ground parking blocks will be needed as a result, which also contributes to the effective use of ground surfaces as a resource. Roads and bridges are also being built above the flood-line at least 7.5/8,3 meters above sea level. Traffic in the district, as well as between HafenCity and the rest of the city, therefore keeps flowing even during a storm surge by diverting around the lower-lying Speicherstadt. The developer responsible for these infrastructural measures is HafenCity Hamburg GmbH. The district can continue to function virtually without restriction even during flooding and despite its "island" situation. In cases of high water, a few underground parking garage entrances along Am Sandtorkai and Brooktorkai (directly opposite the Speicherstadt) do have to close their flood gates. This is because, if the roadways (Am Strandkai and western Brooktorkai) passing directly adjacent to the historic warehouses had been retrospectively elevated, the identity and function of the whole Speicherstadt ensemble would have been affected. Planners of the listed Speicherstadt had worked on the assumption that their area could be flooded in cases of extreme high water. A broad strip up to 15 meters wide along the edges of the lovingly restored historic quays is down at the existing 4,5 to 5.5 meter level of the HafenCity area and provides 10.5 kilometers of waterside walks. This adds up to a lot of public urban space right next to the water. In the western part of HafenCity many of these squares and promenades are already in constant use. Thus the "Warft" solution also has the side-effect of allowing a totally new topography to take shape - which will put its own stamp on the character and quality of the district.